Making it to all 59 National Parks with official “Park” status is a lofty goal, particularly given that a few of them require unorthodox access methods from expensive plane rides down to dog sleds to reach them. But still, seeing as many as possible makes for a good outline to fill in along the way. My theory has always been that there must be something particularly noteworthy for a park to achieve this esteemed official “Park” status. Last summer, that theory was put to the test when I visited Pinnacles National Park in California. Granted there were some beautiful hiking trails there, but I saw nothing to boost it up into the upper echelon of national park sites. Finally, an off duty park ranger confirmed my suspicions…its promotion to “Park with a capital P” rode in on the back of political pork. 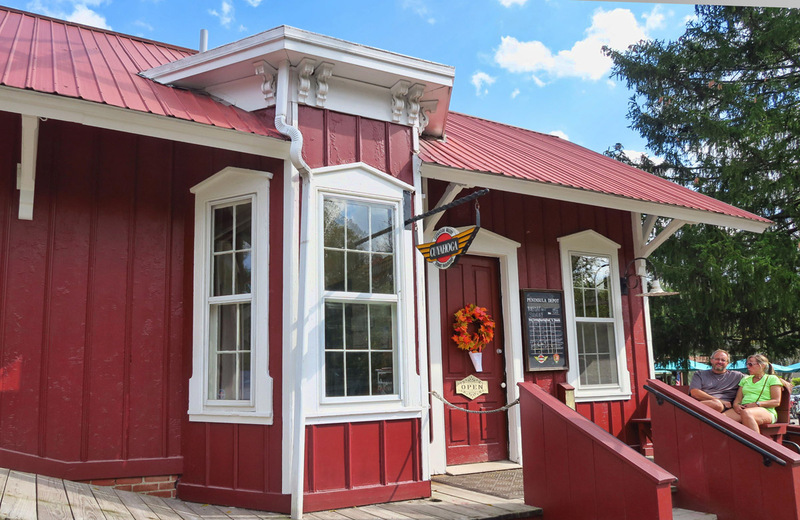 The Boston Store, Cuyahoga Valley NP Visitor Center. 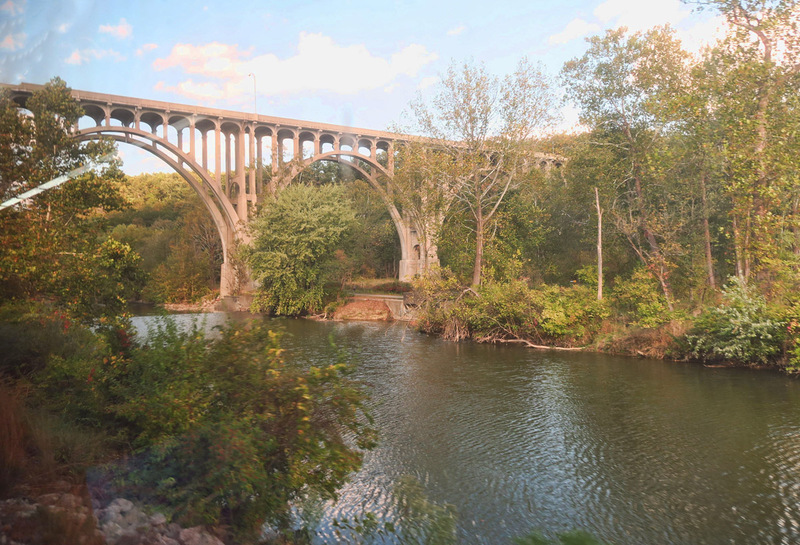 The Cuyahoga Valley Scenic Railroad runs through the park alongside the historic Ohio & Erie Canalway. 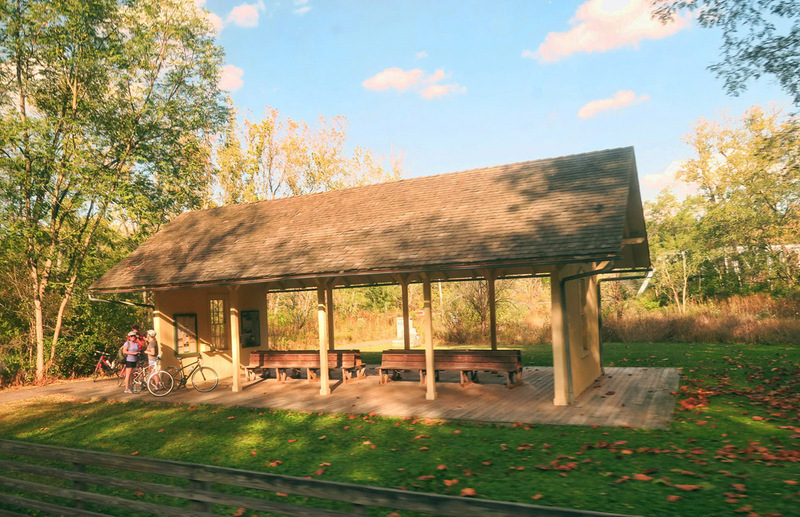 It’s possible to load up your bike for a one way ride, returning via the Ohio & Erie Towpath Trail once used by mules to tow the canal boats loaded with goods and passengers. 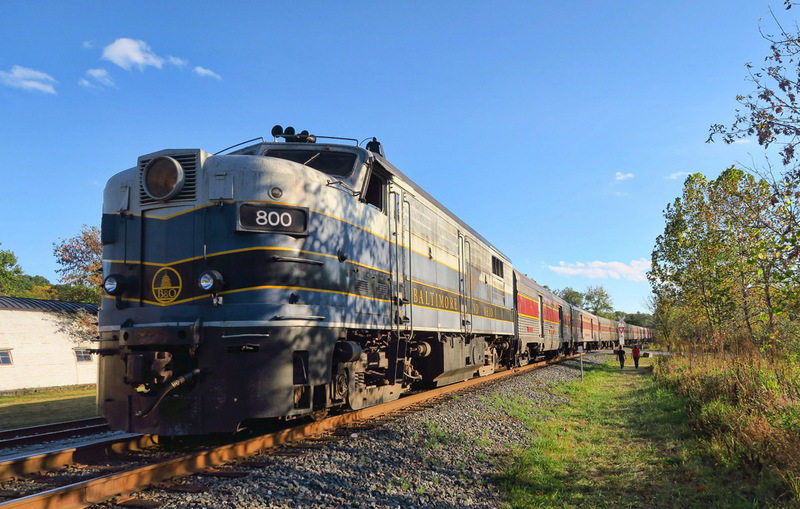 But to be honest, I’ve seen better “scenery” from the Long Island Railroad! 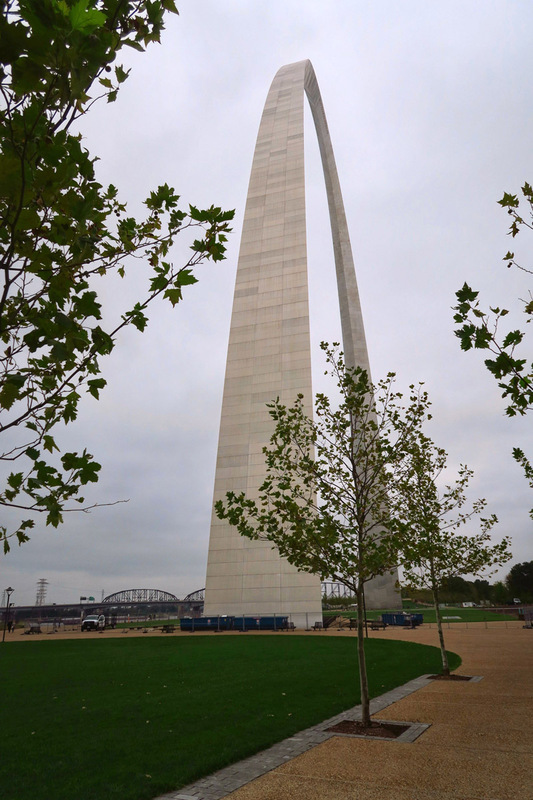 Next up on my mini-bucket list along my chosen route back to Texas is the Gateway Arch in St. Louis, Missouri. This visit will also tick the state of Missouri off my “On the Road to Fifty” states list, leaving only the Dakotas, Wisconsin, Iowa and Nebraska still on my “uncharted territory” list. However, I quickly figure out why my friend Box Canyon Mark calls it the land of Les Miserables, as Missouri feels a bit more like “Mis-er-ee.” Driving across the state, I never shake the feeling of “bleak, gray, depressing, and a little unnerving.” Of course, the cloudy skies don’t help. I drive to the closest Walmart five miles away to leave the Winnie so I can drive the Tracker back into the downtown area. The area feels a bit “oppressed,” leaving me somewhat uneasy. It’s the first time I’ve ever gone in to ask Management if it is okay to park….during the daylight! 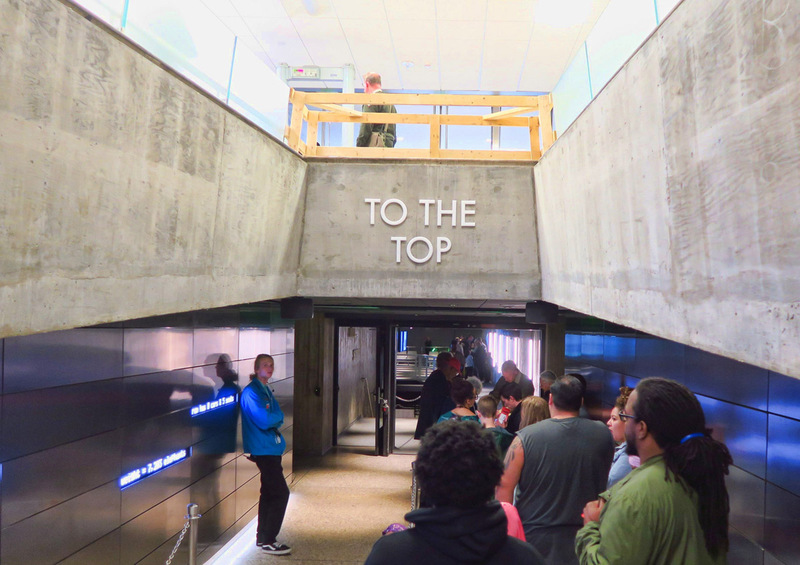 Inside the Jefferson National Expansion Memorial, pedestrian-only zone of the Gateway Arch. 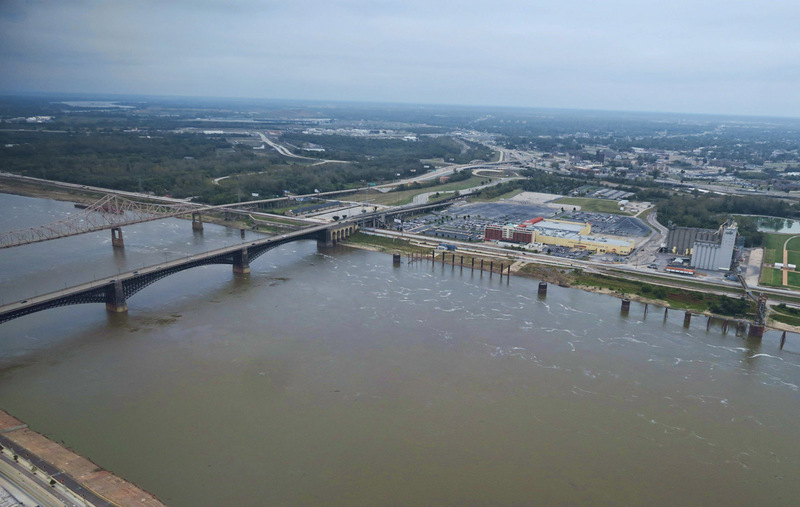 Arch overlooks the Mississippi River. It’s tough photographing gray steel against a steel gray sky. Entry to the “Journey to the Top” ride up into the arch is by timed ticket. 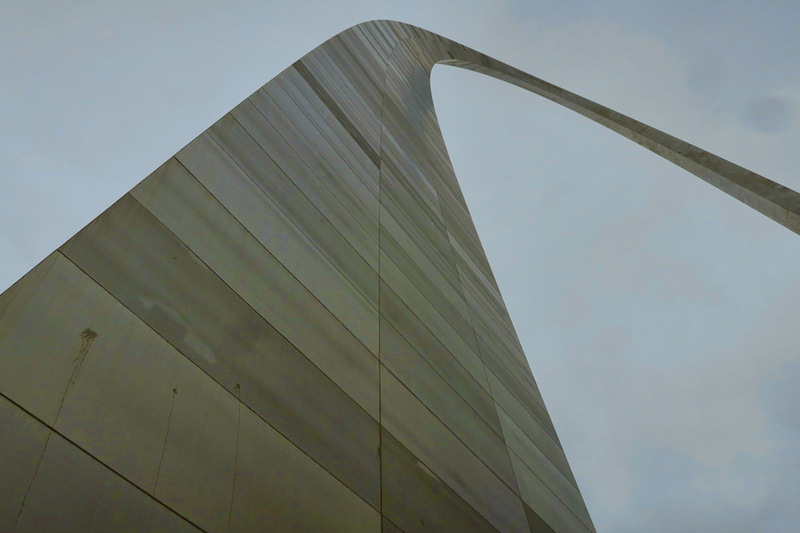 If you arrive early, be sure to watch the film on construction of the arch…I found it more interesting than the “journey” itself. 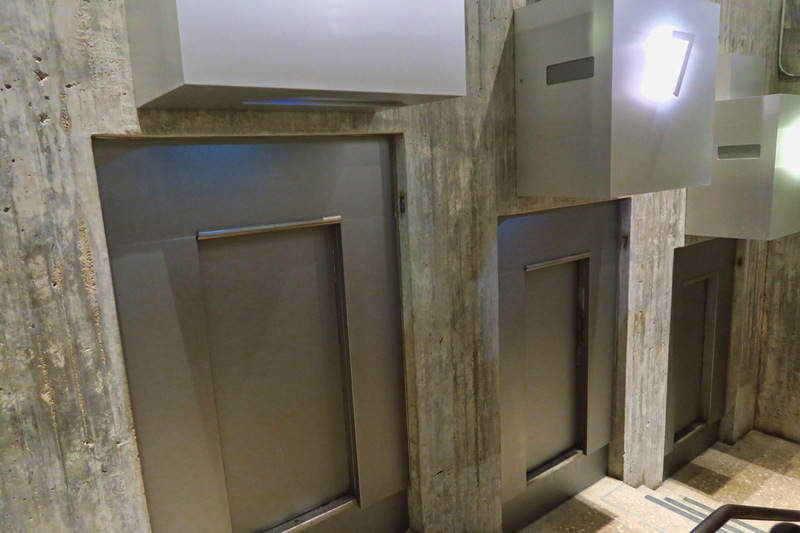 These staggered doors open up to reveal eight “pods” each carrying five passengers to the top. Seating for five. It’s so small in here that I can’t sit up straight. I am sure there was some warning about claustrophobia, but I never saw it. It’s 630 feet to the top, and the ride takes approx 4 minutes, while the trip down takes only 3 minutes. Looking out over downtown St. Louis and the Old Courthouse. 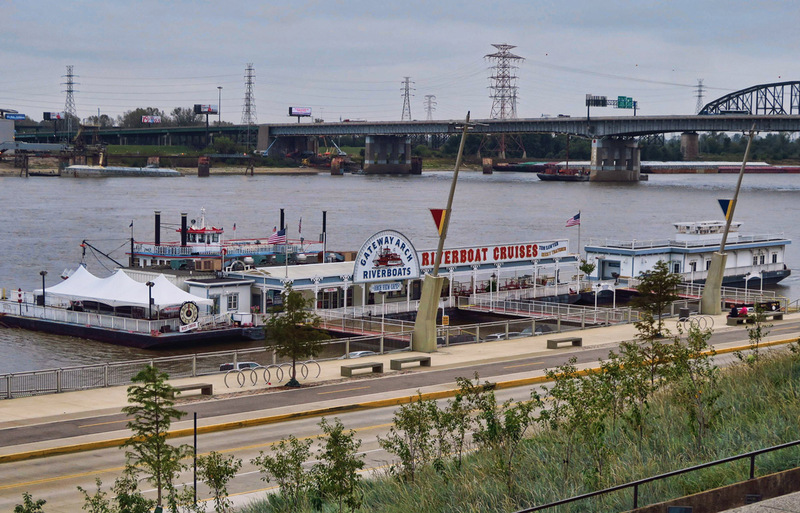 Looking back across the Mississippi River to Illinois and the very unfriendly Casino Queen. 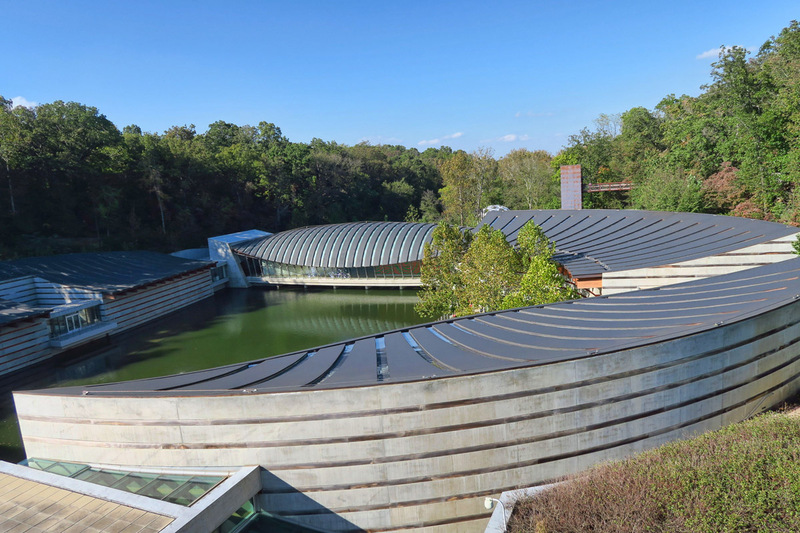 While both attractions above fall into the category of “I’m glad I went, but I wouldn’t go again,” that is not the case for the Crystal Bridges Museum of American Art in Bentonville, Arkansas. The beautiful grounds and exhibits are well worthy of time spent and more. 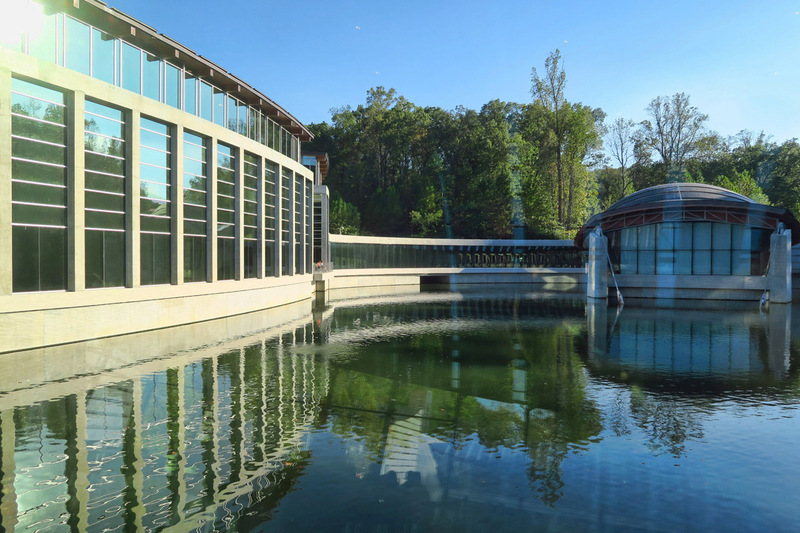 Named after Crystal Spring which flows into the reflecting ponds, it wasn’t the Crystal Bridges museum that put Bentonville on the map, but rather the brain-trust of the founder, philanthropist Alice Walton’s father, Sam Walton. 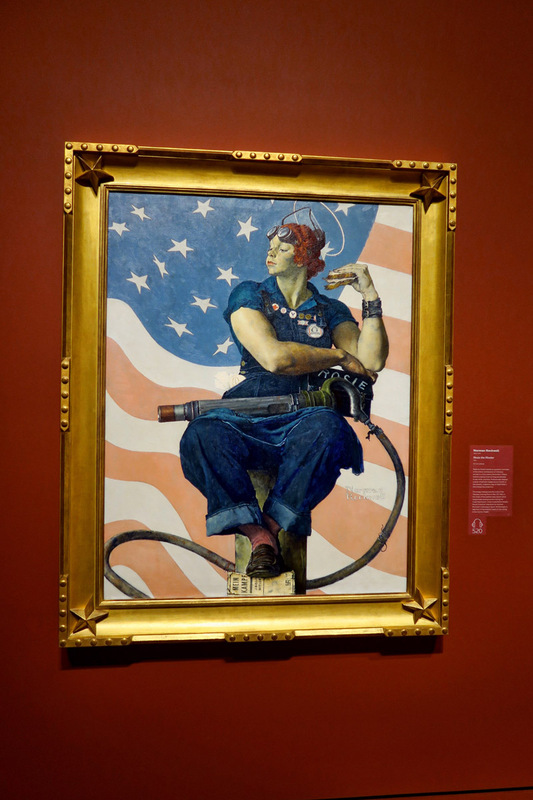 It’s difficult to associate a fine art collection with the name “Walmart,” so it’s no surprise that distance is maintained between Walmart and the ownership and development of the museum collections. However admission is sponsored by Walmart, thereby making it free, every day, all day. 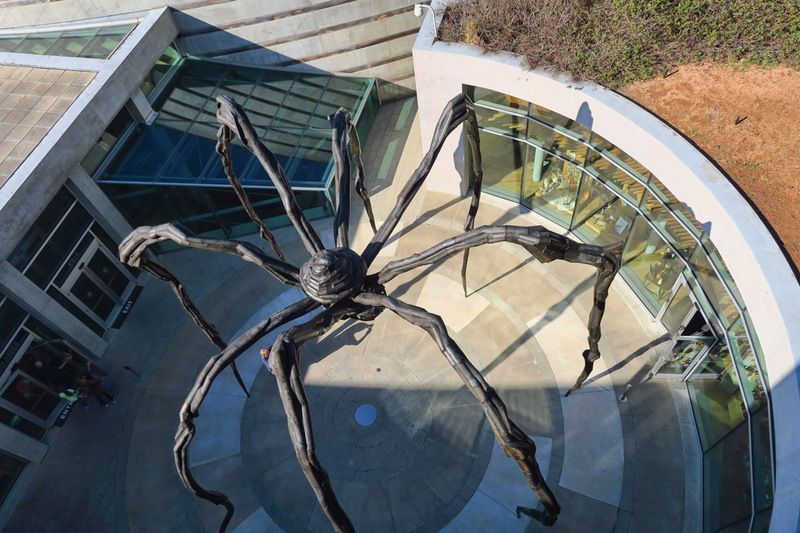 Attractions like Crystal Bridges museum, an abundance of green space, and over 100 miles of mountain biking trails, 75% of which were built in the last 10 years, contribute to Bentonville’s growing popularity. In fact, International Mountain Bicycling Association held its world summit in Bentonville in 2016. 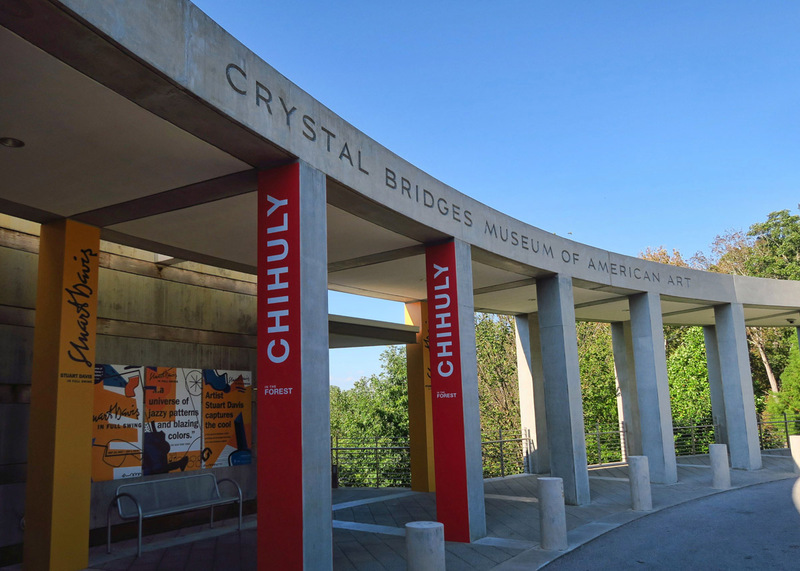 A great way to explore the Crystal Bridges museum is on a night when the museum is open until 9:00pm (Weds, Thurs, or Friday.) Crowds are lighter, there are fewer kids, and the changing light on the angles and curves of the buildings reflecting in the ponds is a work of art in of itself. The restaurant, “Eleven” offers happy hour specials at the bar, or full dinner service. It’s a great way to break up the visit with some fancy cocktails or craft beer to rest our weary feet and “cleanse the palate” without overdosing on artwork. I had the good fortune to arrive during the “Chuhuly in the Forest” exhibit. 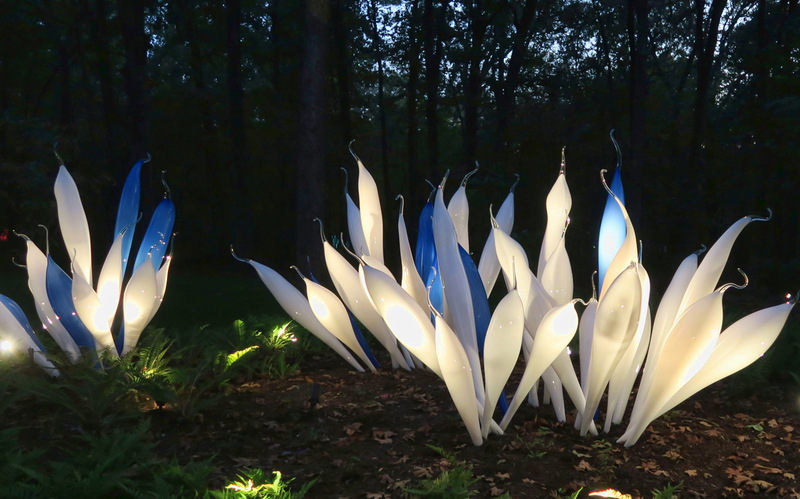 The lighted displays of the blown glass placed in the woods truly made it seem like an enchanted forest. The 200,000 sq ft museum was built on Walton family land between 2006 and 2011. 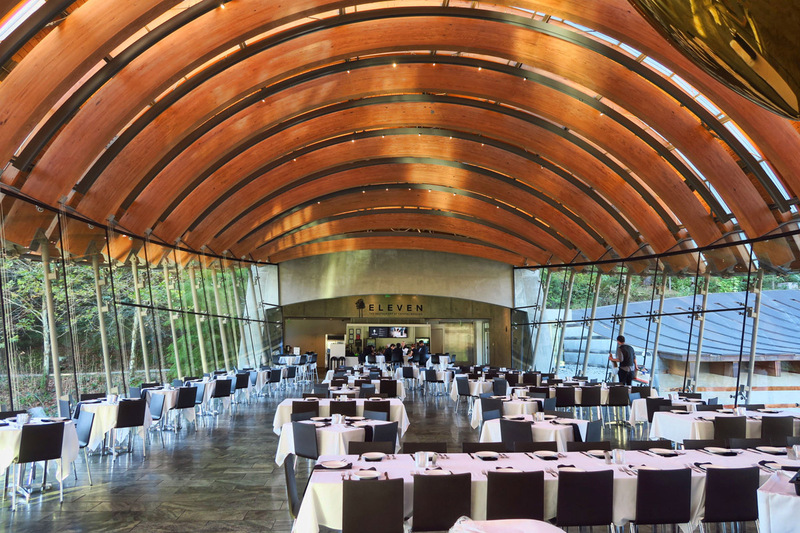 The museum’s restaurant, “Eleven” named after the opening date of 11-11-11. Buildings are arranged in an abstract circle, with the art following in chronological order. 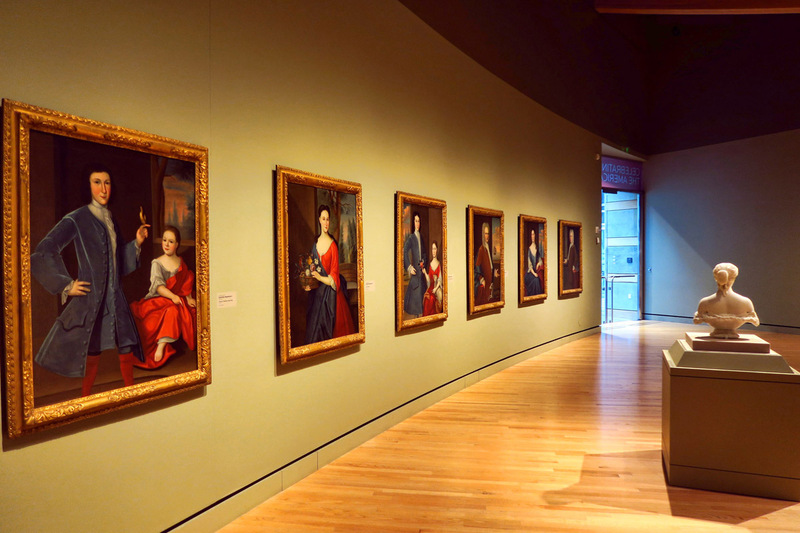 The museum’s permanent collection features American art from the Colonial era to the contemporary period. All of the featured artists are United States citizens. 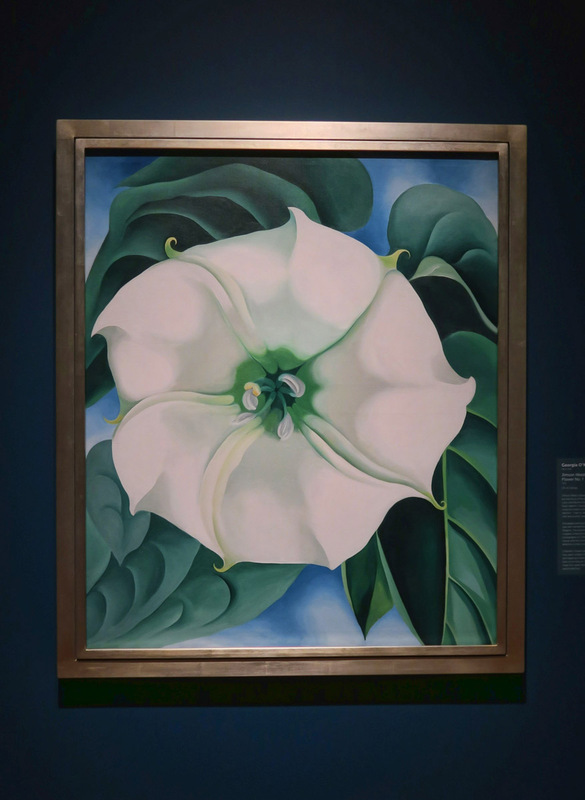 Remarkable that Georgia O’Keeffe’s Jimson Weed/White Flower No. 1 is the “World’s most expensive painting by a woman,” purchased for $44.4 million. 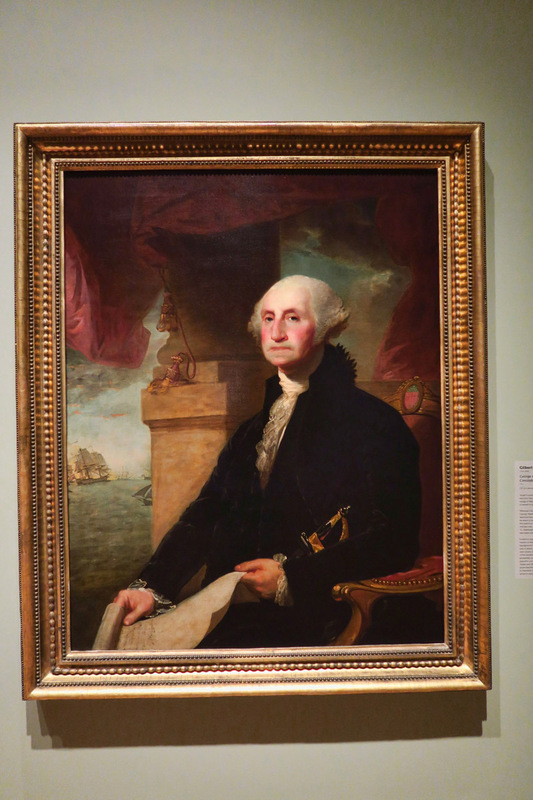 Gilbert Stuart’s portrait of George Washington currently portrayed on the United States one dollar bill. 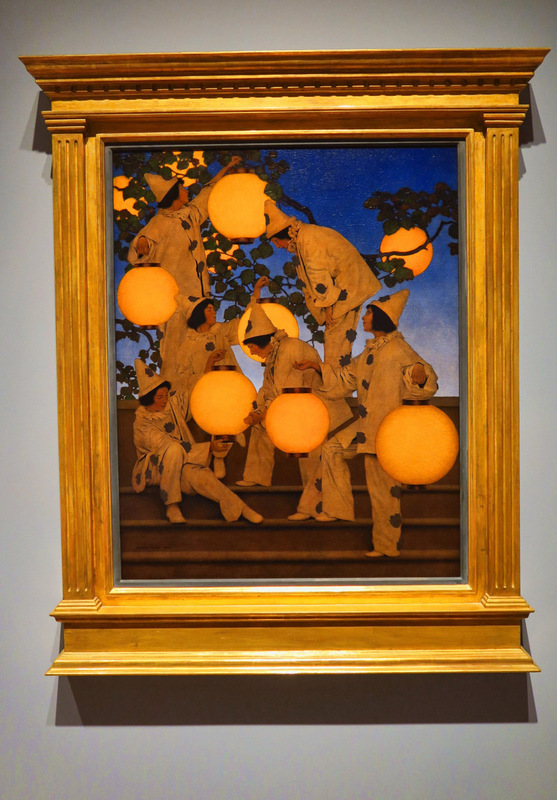 Maxfield Parrish’s “The Lantern Bearers,” 1908. 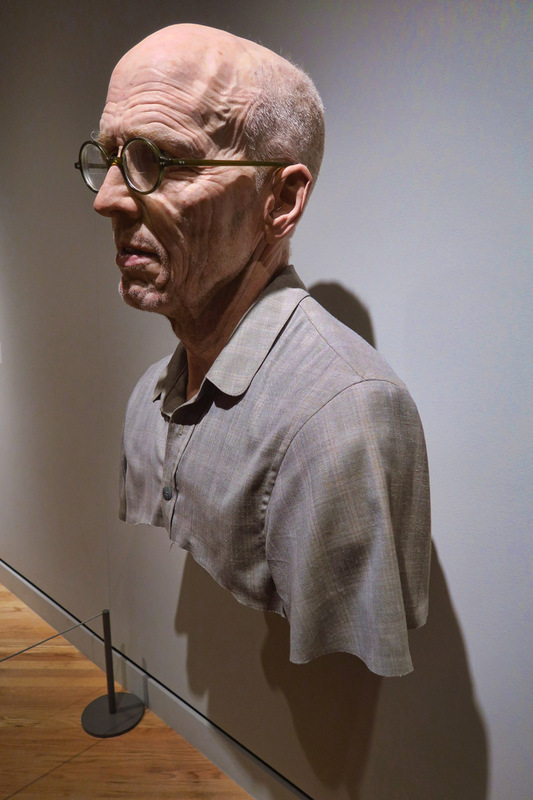 Life-like to the point of creepy giant-sized self portrait of artist Evan Penny. 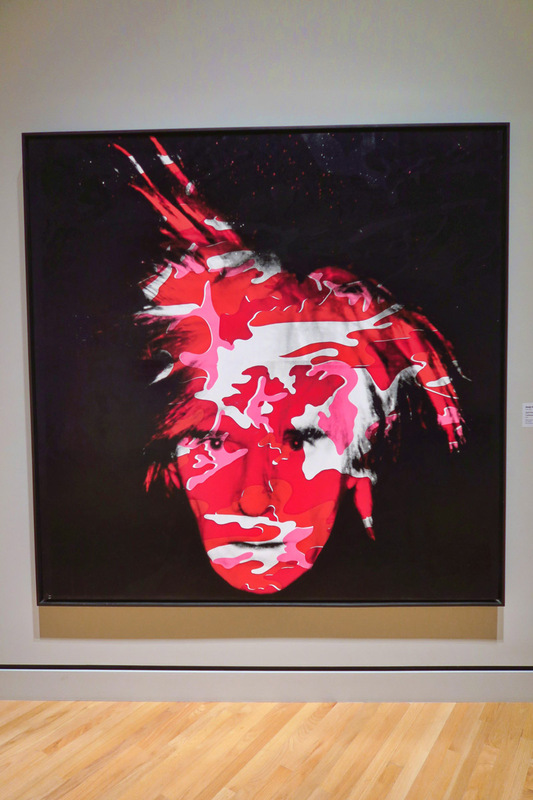 What is American Art without Andy Warhol? Though most of the artwork is in the form of painting, there is some sculpture as well. 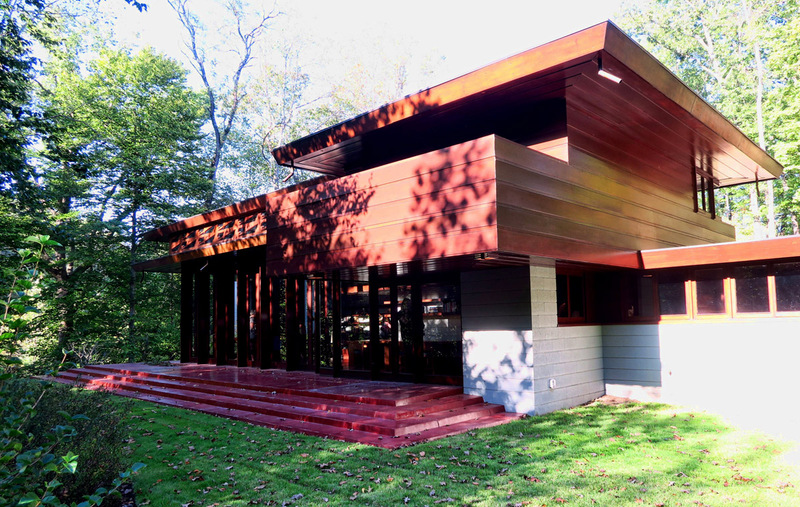 On the museum grounds is also Frank Lloyd Wright’s Bachman-Wilson House, originally built in 1954 near the Millstone River in New Jersey. 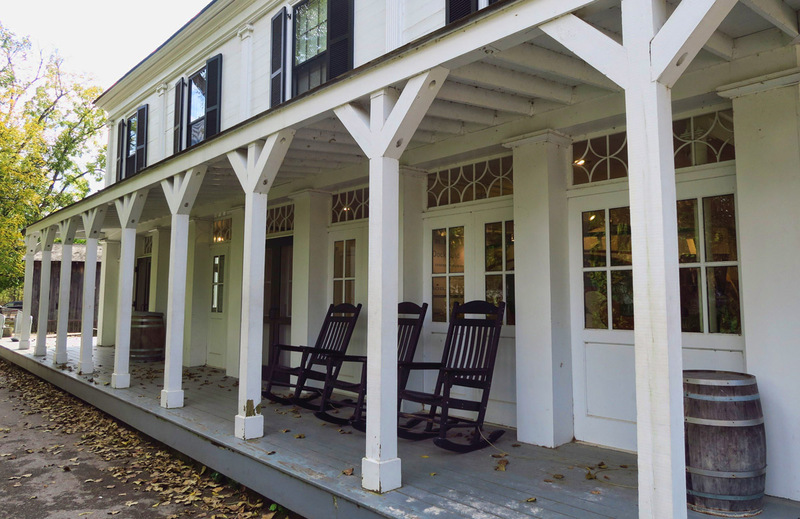 After a series of floods, the New Jersey house was dismantled and relocated to the museum grounds in 2014 to preserve and protect. I recommend the tour inside, though no photography is allowed. Dave Chuhuly chandelier in one of the pavilions. I had the good fortune to visit during the “Chuhuly in the Forest” exhibit. 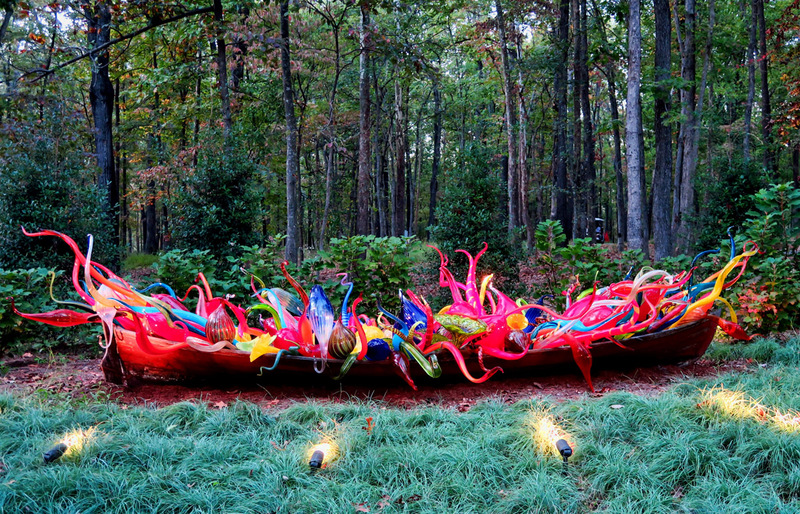 A walk along the dimly lit path was magical, with nine works strategically placed within the Ozark Woods. 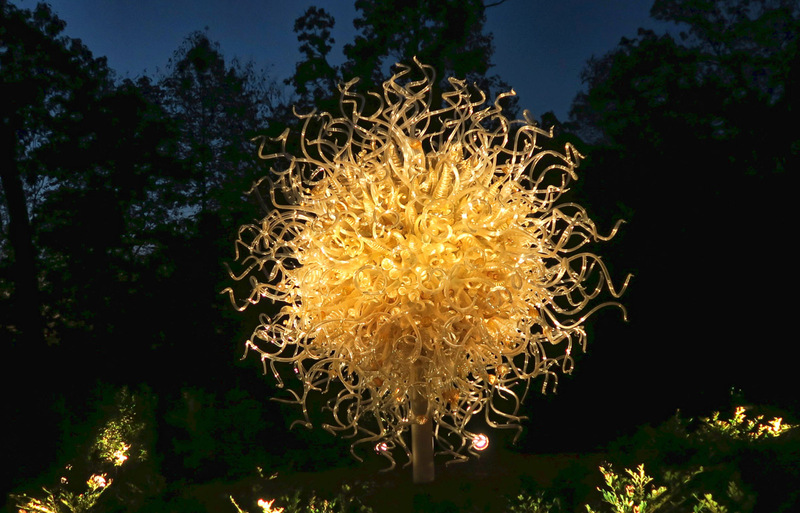 This one is called “Sole d’Oro” or “Golden Sun,” and contains 1,300 hand blown pieces of glass and weighs over 5,000 lbs. I enjoyed my visit spanning from daylight to darkness. The last thing “seen along the way” was an unscheduled overnight stop at an abandoned nuclear plant outside of Gore, Oklahoma. On the horrible, jarring stretch of road that is I-40 out of Fort Smith, AR, I looked in my back-up camera to see the Tracker “tracking” to the right. One of the expandable arms of the tow bar had jammed in the collapsed (compressed) position, and the Tracker was towing to the side of the Winnie with one arm collapsed and the other extended like a stiff-armed dance partner. The spring in the extending arm was beyond repair, so after an hour of trying, we agreed he had no choice but to jam a bolt in under the lever locking it in the extended position, rendering permanent damage to the collapsing arm. (The tow bar is old anyway, and when last serviced at Blue Ox in Quartzsite, they recommended replacement soon.) As long as the bolt held, I would be fine to make it on in to Texas. But by the time he got it jerry-rigged, it was near dark. I typically try to avoid driving after dark in the best of conditions. Farmer Larry stores all his hay baling equipment in the parking lot of an old abandoned nuclear facility. Having few options, I accepted his offer to overnight there in the abandoned parking lot. Surrounded by $100K of farm equipment on all sides of me, I felt fairly safe despite Farmer Larry’s repeated questions about my traveling alone. I am not typically a risk taker on the road, but this was one of those times when I had little choice but to operate on Blind Faith. 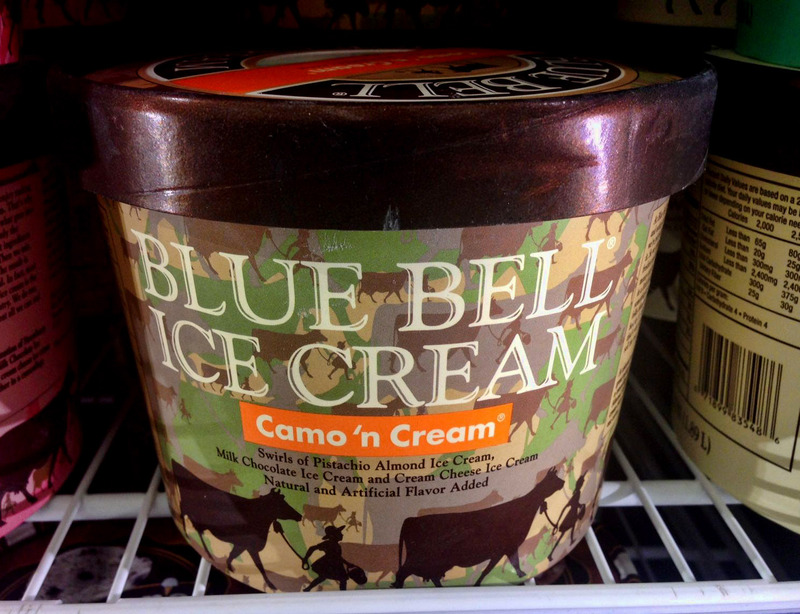 You know you’re back in Texas when even the ice cream wears camo! 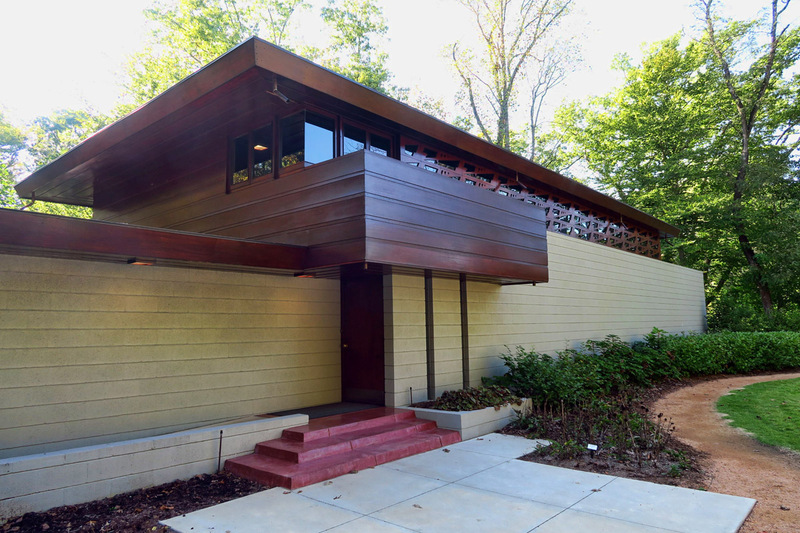 This entry was posted in Arkansas, Missouri, National Parks, Oklahoma, Texas and tagged Bentonville, Crystal Bridges Museum of American Art, Cuyahoga Valley National Park, Gateway Arch, St. Louis by Suzanne. Bookmark the permalink. Oh, too bad you’re not closer to southern OR. I have my Falcon All Terrain hitch (only used for 1,000 miles) for sale and I’d give you a great deal! 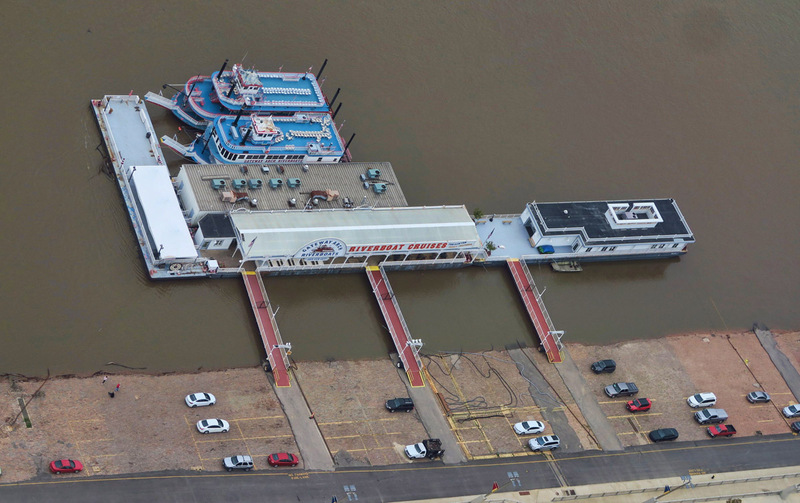 I grew up in St. Louis…thanks for not being too hard on our landmark 🙂 I bet you can understand why I’ve progressively made my way west across the U.S. BTW, I made a reservation for a campsite at the Maritime Center in Port Townsend for the Wooden Boat Festival next September…maybe I’ll see you there! Good to hear you got back safely with some kind help from Farmer Larry. Self preservation naturally makes you cautious and wary, an essential element in travelling alone. I would have been no good at the top of the arch in such a confined space. I had to laugh at Farmer Larry’s response to where to go. It is true they do true to fix everything themselves. Interesting that 3 or the 5 states you have yet to hit is where we spend much of our time. The Dakotas may seem flat and boring at first sight but there are some hidden gems in each state. Teddy Roosevelt National Park and The Black Hills are two must see areas. Rode to the top of the arch once in my life and that definitely was enough. I can still close my eyes and see myself crammed in the pod “ratcheting” to the top! 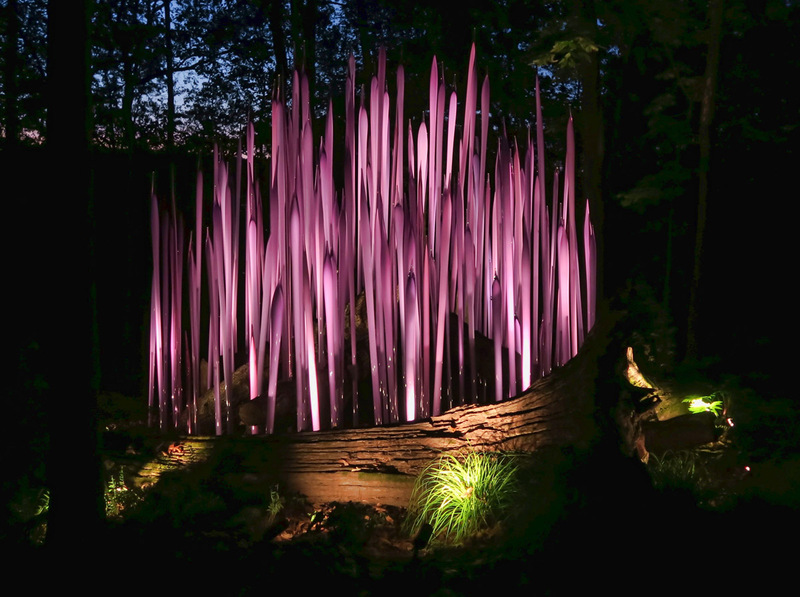 How lucky to see the Chuhuly in the Forest exhibit – beautiful! And I do agree that the Evan Penney self portrait is really creepy. Those farmer dudes can come in pretty handy most of the time! I can’t tell you how many times Chris has ended up working on people’s motorhomes and jeeps in the campgrounds. He even brings a set of “work clothes” in case he needs them. Having lived in Les Miserables all my life I can attest to BC Mark’s assessment of Missouri. 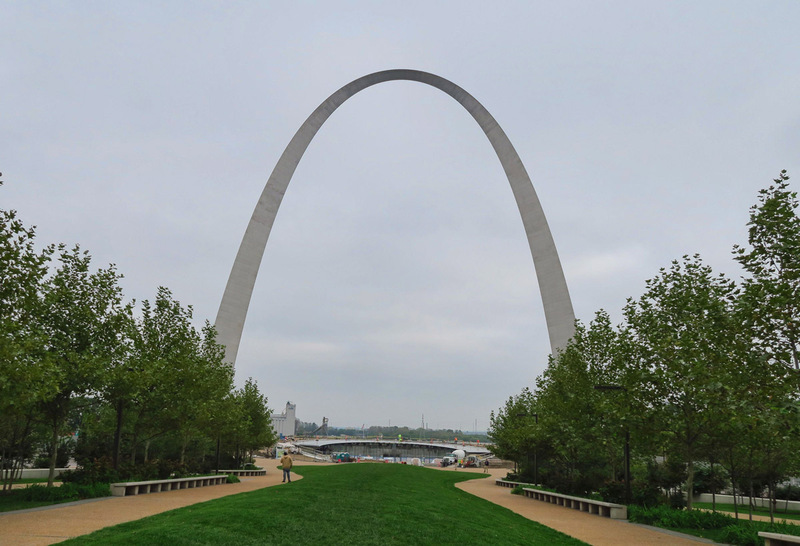 I have been to the top of the Arch and other Parks in the Midwest and for me its hard to compare those with the Great National Parks of the West. When I think of National Parks, the west beats them all! Thanks once again for your vivid word pictures (along with gorgeous photos). I do want to offer a small defense of the Arch. I live on the west coast, but I once spent three months in St. Louis. On a non-cloudy, non-hostile-parking day, the Arch can be lovely. 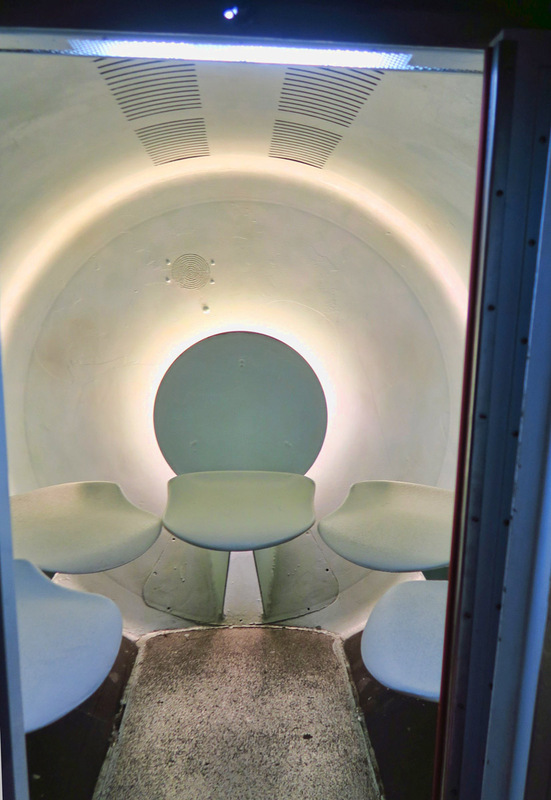 If you are not claustrophobic, you can spend your four minutes in the “pod” figuring out how the heck they managed the design so you could get up there at all. And the view is breathtaking on a nice fall day. It’s also pretty at sunset. As with so many things, I suppose, timing is everything! 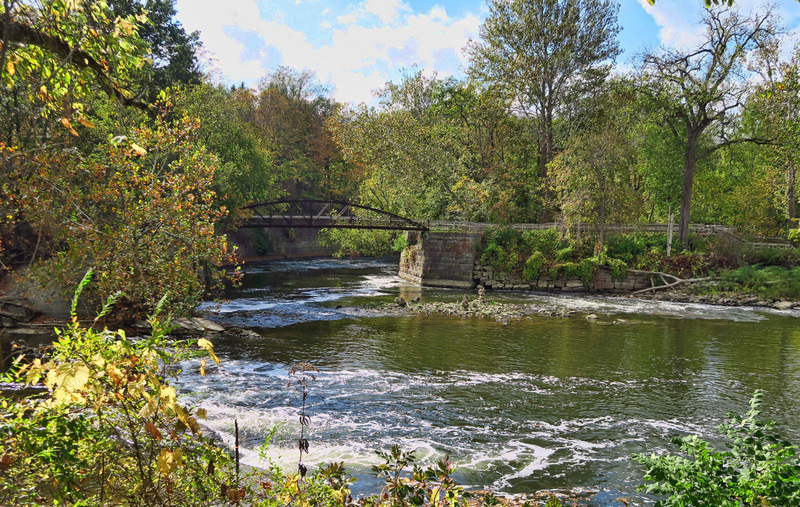 So sorry your visit to the Cuyahoga Valley NP was a bust. You should have ridden your bike on the towpath and then for $3 rode the train back. There are many nice hiking trails with one nice waterfall and also the ledges set in a hemlock forest which is unusual in OH. I appreciate being able to ride my bice without any cars. I am surprised you didn’t go to the Rock ‘n Roll Hall of Fame with your music theme. Maybe you have been there before. Thanks for the information on the Bentonville Museum. Boy, your timing was incredible with the art museum and the Chihuly show. 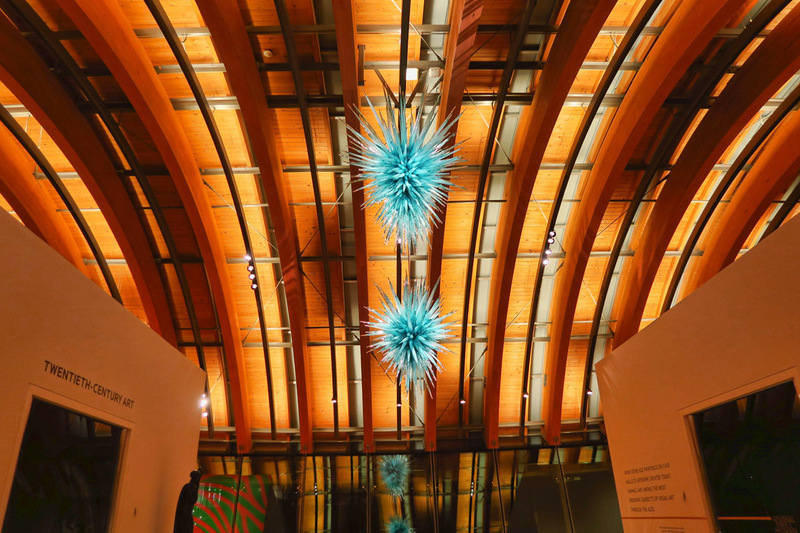 I am a huge Chihuly fan! What amazing luck with your tow bar issue. Serendipity was smiling on you for everything to fall into place safely. I picked up parts from a salvage yard when a Jeep was totaled after a tow bar failure . As light as the View is it, well so glad you noticed the problem in time. 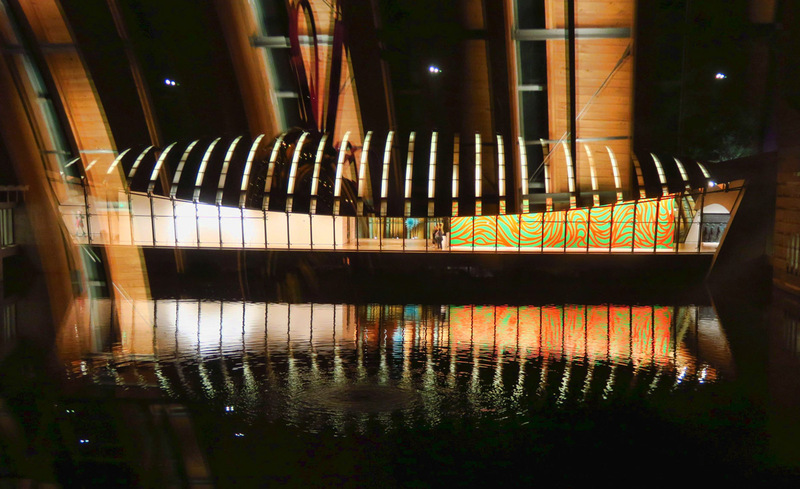 Despite my distaste for anything Walton, I will have to put Crystal Bridges on our list. We have found also, that there are parks that do make one wonder what, why and where? Nowhere is quite the same as Newfoundland? We are on our way out to Texas and will be in your neck of the woods soon. Maybe we can see you? Love anything by Chuhuly. Yikes about the tow bar but you did everything right. I was holding my breath while reading the part about your tow bar Suzanne. So glad Farmer Larry was a kind man and you got to Texas without any more mishaps. As to some of the places you stopped along the way, I too would like to tick off all the national parks but I don’t see us doing that, given the expense of getting to some. I always thought we could check Cuyahoga Valley National Park off the list as we are back in Ohio from time to time visiting family. I didn’t think it would be too exciting and now I know it’s not! I do think we have some thrilling NP’s in our near future. 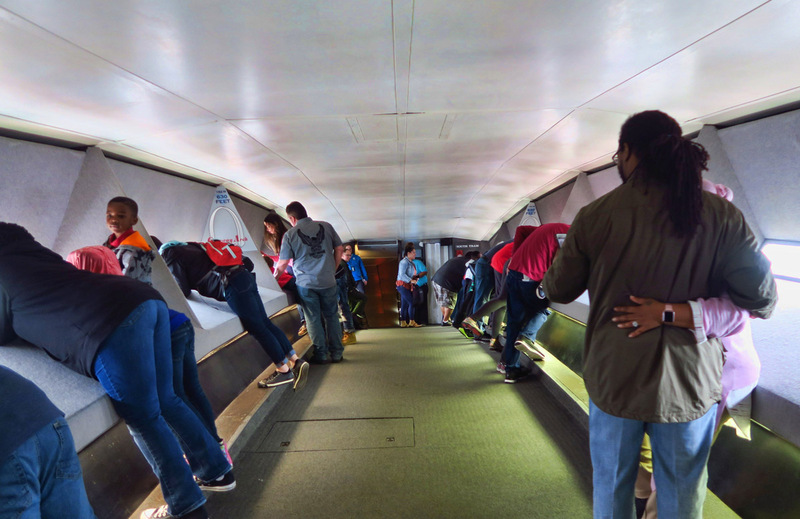 🙂 The Gateway Arch in St. Louis is something I tackled back before hubby and I remember it as being claustrophobic. But if in St. Louis, it must be conquered. 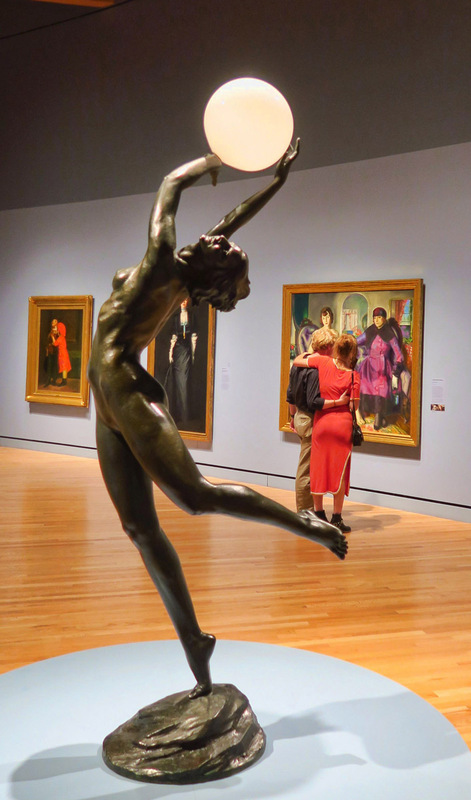 My choice of everything you listed would have been the Crystal Bridges Museum of American Art, just my kinda place. I love the spider, Maxfield Parrish’s “The Lantern Bearers,” the Andy Warhol art, and even the creepy self portrait of artist Evan Penny. And just utter the word Chuhuly and I am there. 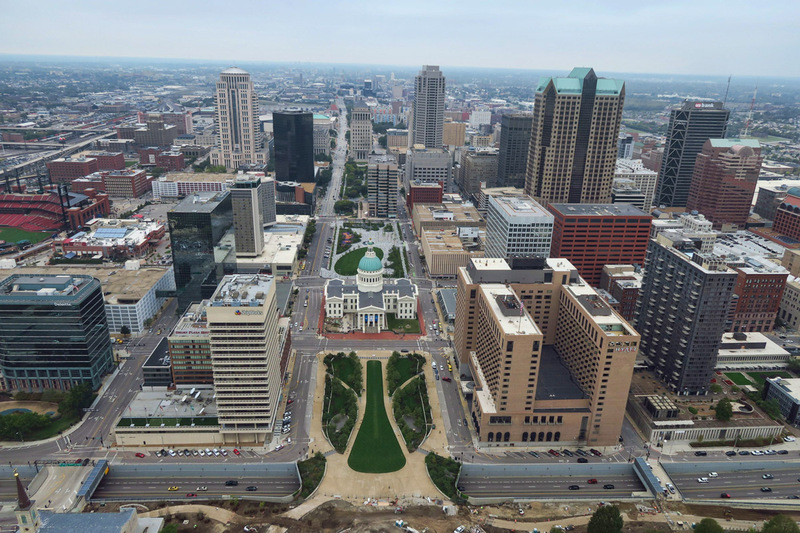 I definitely would never go to the top of the arch, even though I have looked down on it from an airplane many times. I agree with your take on these parks. Enjoy your trip. I visited the Arch in 1978 with my husband and 1 year old daughter. I recall the ride being more like being strapped into an amusement ride car. Either my memory is fuzzy or things have changed at the Arch. I have avoided the St Louis area for many years now. The roads there are a mess. I may have been a nervous wreck staying near the farmer, but if in a similar situation, I would use my gut instincts for the final decision to stay or drive through the night. I have driven away from a few places, in the past 6 years, then continued on to a different overnight place.